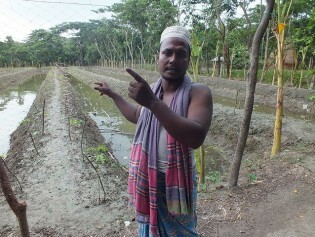 A continuous influx of sea water is threatening agriculture and food security in vast coastal areas of Bangladesh, but farmers are finding ways to adapt, like cultivating fish and crops at the same time. After more than a century of fighting sea erosion by massively dumping granite boulders along the beaches of southern Kerala state, environmentalists and administrators are beginning to see that this has been a costly and ineffective solution. Sea level rise near Papua New Guinea, a Small Island Developing State (SIDS) in the southwest Pacific, is estimated at seven millimetres per year, double the global annual average of 2.8-3.6 mm. As schools of whales move to music undersea at image definitions of 6.54 million pixels on the giant ceiling mounted LED screen, 218 X 30 metres in length and width, expectations run high from the International Exposition Yeosu Korea 2012 at harbour town. The expo showcases 104 participating countries’ visions and achievements on the Expo theme: ‘The Living Ocean and Coast: Diversity of Resources and Sustainable Activities’. Like most of its neighbours in the English-speaking Caribbean, Barbados's main economic asset is its coastal zone.